I had the pleasure of interviewing Russell Olsen is vice president of innovation and product management for WebPT, the leading rehab therapy software platform. At WebPT, he leads category design, product management, user experience and product discovery, applying disruptive innovation approaches to accelerate growth while solving customer and market problems. Russell has 15 years’ experience in healthcare and growth companies, and has delivered innovations impacting millions of lives during his time at IBM Watson, Phytel and MDdatacor. I joined Phoenix-based WebPT last year as the vice president of innovation and product management. In line with our mission of empowering rehab therapists to achieve greatness in practice, I’ve been focused on walking through the entire patient journey and identifying how we can support that journey with the right technologies and innovations to maximize patient outcomes, performance and business growth. Prior to WebPT, I led product teams at other healthcare organizations like IBM Watson, where I identified ways to use machine learning to aggregate data on interventions and improve patient care. I also researched ways to utilize AI, data and other technology to do the same. I graduated from Brigham Young University with a degree in electronics and information technology. I also received a certificate in Disruptive Strategy from Harvard Business School in 2017. Outside of work, I spend time with my family, including my amazing wife and four wonderful boys. Can you share the funniest or most interesting story that happened to you since you began working at your company? One of the things my team has done to learn more about our customers is implement a “secret shopper” program. 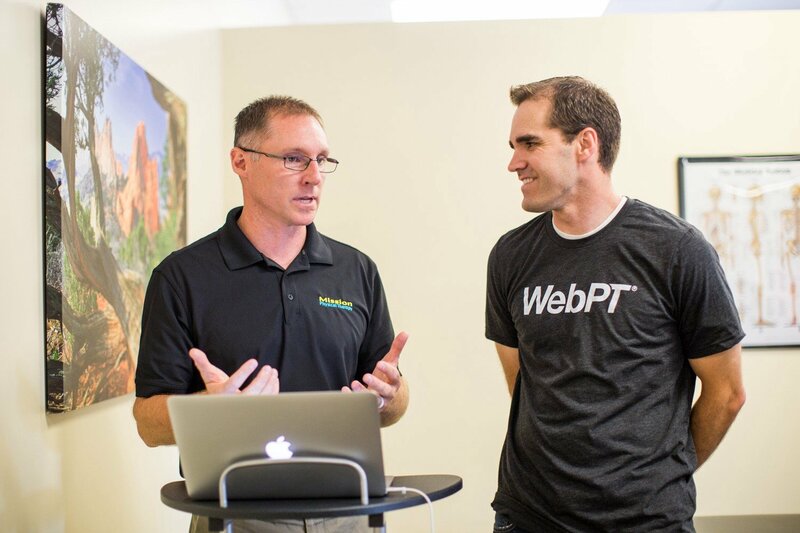 At WebPT, we seek to empower rehab therapists to enhance patient care and fuel business growth. To do that effectively, we have to intimately understand how they’re delivering care, so we visited partner clinics ourselves and actually underwent physical therapy. Fortunately, we didn’t have any real injuries, but we got to go through the whole physical therapy experience, which was incredibly insightful. From the very beginning of the process of finding a clinic, to checking in, filling out forms and setting up payment, all the way to actual treatment, we went deep into the experience to understand the mindset of a patient. It was a real learning experience for our team. We were able to get a lot of insights that we’ve implemented in our products to improve the healthcare experience for patients. What makes WebPT stand out goes back to our roots as a company. WebPT was built by the very customer we serve — rehab therapists. Our founder, Dr. Heidi Jannenga, was a leading sports physical therapist. After identifying dictation and paperwork as her practice’s biggest expenses, she decided she needed a more cost-effective solution. When she realized that no physical therapy-specific or web-based solution existed, she decided to build her dream platform. With the help of a savvy technologist, the platform was built in just 10 months and then tested in the clinic setting before officially launching in 2008. Today, WebPT has more than 81,000 members nationwide. The fact that this company was born into the rehab therapy industry keeps us very grounded in our mission of helping therapists achieve greatness in practice and improving patient care. I am always looking for new ways to drive innovation and quality improvements to reduce the cost of health care. Being a cloud-based system, WebPT has an analytic foundation that is very powerful. After 10 years, we’ve amassed a big data lake that we are using to gain insights into behavioral profiles and motivators that providers can use to improve patient care in their practices and truly help improve the overall healthcare experience. I would tell other leaders to cultivate empathy by getting into the weeds and immersing yourself in the client experience. I set a goal for myself and my team to visit a total of 144 member clinics every year. We meet with customers in their locations so we can more intimately understand what is going on in their practices. It helps us learn how to implement solutions that will help providers to grow their practices and overcome their biggest business challenges. When you fully immerse yourself in the client experience and are empathetic to their journey, a lot of other things will fall into place. There have been a few individuals who have helped me along way. I’ve been fortunate to collaborate with Hugh Dubberly, who has worked at places like Apple and Netscape and does great work on consumer products. He was was very instrumental in helping develop my thought process about how design observations and critical thinking play into delivering solutions — a skill I use every day. Lastly, I’m grateful for my father’s influence. He helped me develop my creative side and showed me the core values of hard work and getting your hands dirty. I wouldn’t be where I am without him. Over the course of my career, I have had the privilege of delivering innovations that impact millions of lives. The companies and initiatives I have been a part of have made significant contributions to driving quality improvements and the reducing the cost of health care. Outside of my career, I’m a devoted father of four boys, and I’m committed to giving back to my community in as many ways as I can, including volunteering as a youth basketball and soccer coach and volunteering with my church. I also led a troop of boy scouts in my community and dedicate time to supporting their personal development through group activities and scout events. 1) Finding the right provider: Patients are now healthcare consumers, and that’s changing the way they want to receive care as well as their expectations for results. Simultaneously, technology is changing the entire healthcare experience from beginning to end — starting with a patient’s initial search online for a provider or doctor. Online reviews provide transparency and are giving patients more control over their healthcare experience. Patients are in the driver’s seat more than ever before — equipped with reviews and research about their providers and their conditions. Technology has brought more transparency to health care and given patients more control over their healthcare experience. 2) Predicting positive health outcomes: Patient similarity analytics and data science are enabling providers to leverage healthcare data to reveal the best pathways for successful treatment. Examining data for patients who have similar conditions, ages, and/or health histories can help determine which courses of treatment are the most effective — leading to better health outcomes. 3) Deepening patient engagement: Telemedicine and digital communications provide channels for providers to communicate with their patients and help them stay on track with their health goals, ultimately resulting in better overall engagement and health outcomes. This technology is also helping patients stay in close communication with their providers, allowing them to become active participants in their personal healthcare journeys and achieve better outcomes. 4) Follow-up improvement: Once patients leave the clinic or doctor’s office, there is often follow-up care or instructions that can sometimes be confusing or forgotten. Technology is empowering patients to follow through with their home care. Physical therapy patients, for example, can access digitized home exercise through apps they can view anytime on their mobile devices. These types of apps make it easy for patients and providers to stay connected by allowing patients to contact their providers through the app itself. That way, patients can communicate obstacles and collaborate with their providers to develop solutions — all without ever setting foot in the clinic. 5) Reducing healthcare costs: Operational analytics are helping healthcare providers understand how their time and resources are being spent. Machine learning is helping uncover new ways to look at data to improve processes and patient care. When care teams leverage data through technology, they get the tools they need to impact the quality of care, which ultimately leads to better health outcomes and, as a result, reduced healthcare costs. I would love to meet Ed Catull, the president of Pixar and Walt Disney Animation Studios. He wrote one of my favorite books, Creativity Inc., where he talks about the concepts they put in place at Pixar to drive continuous innovation. They are constantly creating new things and inspiring the world with their end product. I have read his book multiple times; it’s on my repeat list. I would love to sit down with him to learn more and pick his brain on a few things. If you are out there Ed, I’d love 15 minutes with you.